This is a week I want my “insides” to smile as I reflect on the event we will celebrate on Sunday. It’s not a day to celebrate the Easter Bunny coming to town, but it’s a day to celebrate and remember that the perfect man, Jesus Christ, the Son of God who came to earth to live. He chose to die the most gruesome and cruel death imaginable. His broken body was put in a tomb to decay, but He was gloriously raised from the dead so all who put their faith in Him could really live. What does the empty tomb mean to me? Even though my life was once empty, it is now filled up with abundant goodness that came when I put my trust and faith in Jesus Christ. John 10:10 says Jesus came so we could have an abundant life. Even though I get knocked down a lot, I get back up because Jesus is fighting for me. He helps me dust myself off and get moving again in the right direction. Even though my earthly body is wasting away and life as I know it now will one day come to a halt, I will be made new and escorted into heaven where I will live forever with the One who loves me so. Even though I mess up miserably, I am perfectly loved, restored, and forgiven by Jesus. Even though I will never live a perfect life, I know I am further along in life than I was a year ago and even a month ago. I do not have to “do” anything to ensure all of these blessings will continue. These blessings are mine because of Jesus’ blood that drained from His perfect body. 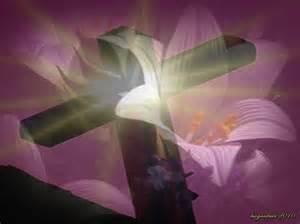 The cross that brought death and the resurrection that brought life show the greatness of the love of God for all mankind. Let us truly live out this full and spiritually rich life that is ours because of perfect love that shows Himself to us in every breath we take. He is alive! My insides are smiling and and I have “Happy Feet”!!!! Praise God for His demonstration of Love for us!!! Jesus! Jesus! Jesus! The Sweetest Name I know!! Yes, so many reasons to smile and dance to the Lover of our soul! Thank you, Kristi, for this wonderful reminder of why we celebrate Easter! I plan to read to Reese this Easter weekend. May God bless you and your family! He is risen, He is risen indeed! Thank you, Jenny! Happy Easter to you and your sweet family! Our lives are full because He rose and lives! Love you, dear Friend!